All in One Princess Club Moonwalk! 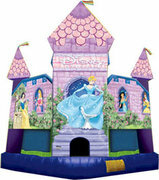 Description: Now your little princess can have the real Disney princesses at her party! This moonwalk is licensed by Disney... no imitation here! The graphics on this inflatable are amazing! You must see it to believe it! This Club bouncer features; Cinderella, Snow White, Princess Jasmine, Belle, and Sleeping Beauty!